NEW YORK (WABC) -- Amtrak and New Jersey Transit service on the Northeast Corridor in and out of New York Penn Station has resumed after a brief delay, but officials warned additional delays are possible. Amtrak spokesman Mike Tolbert said earlier Saturday that train service in or out of the city was halted as crews investigated overhead power issues. 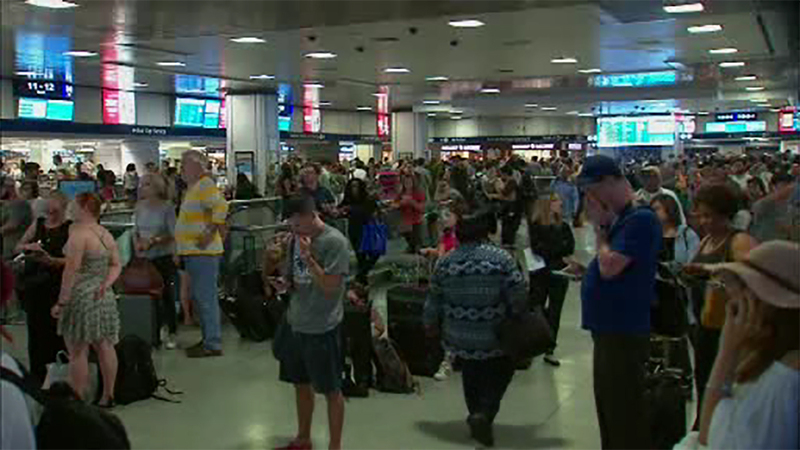 Amtrak announced service was restored between New York and New Jersey after a delay of about 20 minutes. Tolbert says there's no indication that this summer's track repair work at the nation's busiest rail station played a part in Saturday's delay. At 11:30 a.m., Amtrak train #98 from Miami to New York came to a halt just as it was exiting the North River tunnel into Penn Station due to the power issues. The stalled train, with 165 passengers on board, was brought to the platform by 1 p.m.
A second rescue train was needed after the first suffered from the same overhead power issues. The problem came after the first week of major repairs at Penn Station that are forcing commuter rail lines to cut back schedules. The work is to go through the end of August. Amtrak's chief operations officer called the first week of the summer-long track work a success.